Big in Japan! ...Or not. : He bought me... a HAIRDRYER! At the beginning of the month, David and I decided to see a bunch of movies. So, we saw Skyfall in the last entry and since then we saw the Hobbit and Les Mis! The Hobbit was awesome! I was asked to meet David after work, so I went and grabbed a drink at Starbucks, pulled out my book and waited. The staff there are really sweet, even though we can't communicate very much. Always smiling and trying to use their English. And they always put smiley faces on my cups now! So, after work, David walked over to the Bux and we decided to grab drinks for the movie. I picked out White Pepsi. Yep, WHITE Pepsi. No dad, I don't think you'd like it. It's みかん flavoured. I.e. Tangerine flavoured. It wasn't bad, but I don't think I'd go out of my wait to consume copious amounts. So, we both really liked the Hobbit. We watched the 3d version. It had Japanese subs, but the movie was in English. Awesome. We went opening night and there were quite a few foreigners in attendance! I was expecting another Skyfall experience, but nope. Easily like 15 of us in the audience. When we left the theatre, we noticed posters for the new Dragon Ball Z movie that's coming out this year. I took some photos and we had a good laugh, pondering what TeamFourStar will do with it. And we also laughed at Krillin and his newly grown hair. Ahahaha. A few days passed and David and I went to grab some groceries and I ended picking up a new magazine. It came with a great tote bag included, which was the main reason for the purchase. The fact that Arashi was on the cover had nothing to do with it... The package the bag came in had some cute Engrish. So, towards the middle of the month, I went out with some girlfriends. They came up from Fukushima to see the lights in Sendai. They were just as pretty as they were earlier in the month and it was a fun time. We also checked out the candle festival going on nearby. It reminded me of the festival I went to last year in Aizu. They also had a small lights display. And man, it was saaaaaad. So, for those who aren't from my hometown, every year we do a big lights display in the park. And it's been going downhill recently, but it's tradition, you know? I always make a point of trying to go. 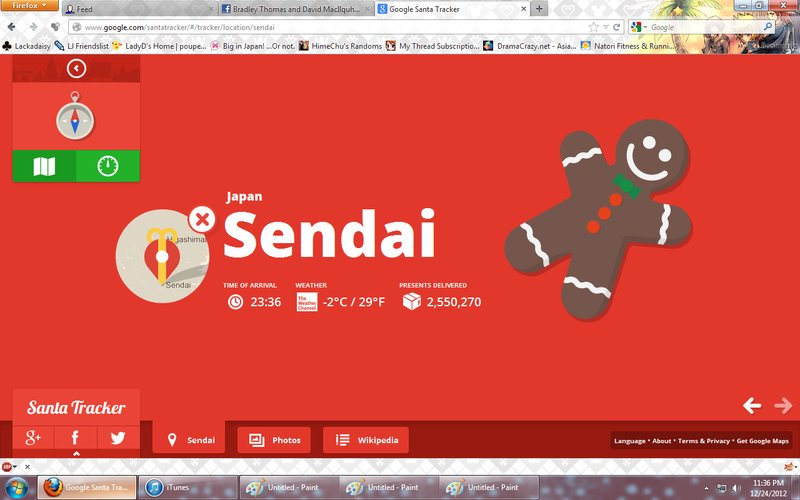 And maaan, Sendai's was just so sad looking. They had an old train near the entrance with like 2 strings of lights and a big smiley face light thing on the side. It only covered half of the train. And the 4 displays they had were small and sparse. I didn't know whether to laugh or cry. I also decided to get slightly dressed up, since it was a date~ It's hard to take a picture of yourself, you know? Or at least, I think it is. I always have such dumb looks on my face when I do. I pre-ordered a CD from amazon.jp last month. The person who created the Synchronicity series was finally going to release Part 3 and Angel and I have been waiting for this for about 3 years. No lie. I was so excited, that I preordered. Yeah. Anywho~ The preorder came with goodies, which was pretty cool. I got a random mousepad and a phone charm. The CD was great and part 3 was totally worth the wait. Although, the ending made me cry. On Christmas Eve we went out. We originally had plans to buy KFC for dinner and get a Christmas cake, too. But, we didn't end up doing that. We ended up going into Sendai for the evening. David worked on Christmas day, so we celebrated that day instead. So, we walked about in Sendai and then on our way home, we bought Christmas cake. It came with a free bowl, which was pretty cool. We grabbed BLTs from the food court for dinner and then went to pick up a few groceries before we headed home. I wanted to see it they'd have any turkeys or turkey pieces in the meat section. And lo and behold, they did! There were 2 turkeys left. And maaaan, were they ever expensive! It was insane. a 1.8kg turkey was 2,980yen. Wow. When we got home, we ate our cake and watched a few Christmas movies. Including It's a Very Mery Eek-smas! Does anyone even remember Eek the Cat? Well, I do. And it was awesome. Eek, The Muppet Christmas Carol and How the Grinch Stole Christmas (the original, awesome cartoon) made our night great. 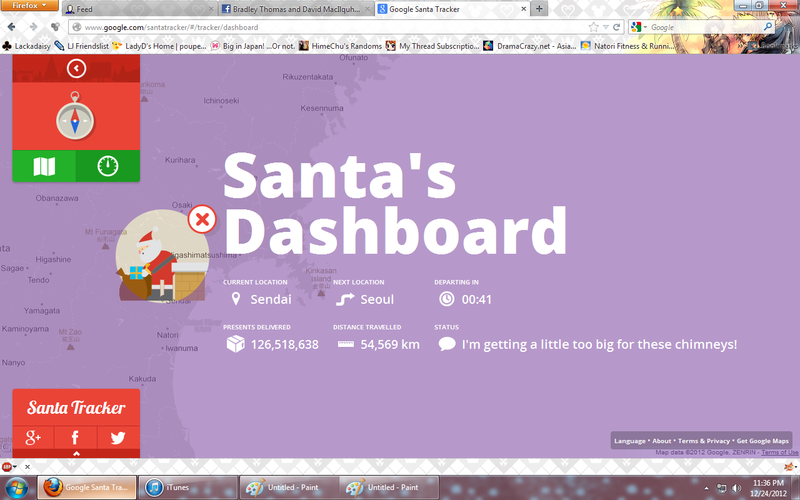 And all the while, we watched the Google Santa tracker thing. It was cute! They tracked his progress as he wound around the world. He visited Sendai at about 11pm. I didn't see him though! Better luck next year! On Christmas Day, David had to work. I skyped with my dad's side of my family and was able to participate in the Christmas part, like last year. However, it was kinda sad. I was alone at home and I couldn't really hear half of what was going on, but it was still nice to see everyone. After the party (which started at 8am my time), I decided to take a nap. I slept for a few hours, and felt a little better afterwards. I checked my emails from my iPod and noticed there was a message from David. He was getting out of work early! And he wanted me to meet him in Sendai for a date! Yay! I got dressed and left to go meet him. It was great! We met at the station, and we ended up going out for dinner. At Freshness Burger. Yup. I had a cheeseburger for Christmas dinner. And onion rings! Yay~ My drink was interesting. I got a lemon raspberry refresher. And man, was it ever sour! It had no sweetness to it. I ended up adding gum syrup to it. After dinner, David pulled out a gift for me! We exchanged gifts the day before, so I was floored when he pulled this out. I had bought David some Warhammer and a Gundam for Christmas. He bought me a few pieces of clothing, including a really pretty skirt. But, this was my favourite Christmas gift. He bought me... a HAIRDRYER! YAY! I've needed one of these since I came to Japan. And it's white and pink! And it works like a dream. Awesome! We didn't really have any big plans for the evening, so we wander about for a bit and then decided to go to karaoke for an hour. It was great! My ability to read Japanese has improved, so I was able to sing some Japanese songs flawlessly! Wooo~ David sang a few Disney songs and some other goofy things. We had a fun time! It's been forever since I've done karaoke! We tried a few UFO catchers, too. David won me a really cute Minnie plushie. She's wearing a furisode kimono for new years! David tried to win the matching Mickey in new years garb, but it was too difficult. Oh well. One thing we do have a match set of now is handtowels! In Japan, everyone carries a handtowel in their purse, pockets, bag, etc. Most public restrooms won't have paper towels and only like 1 air dryer. So, it's just easier to carry your own little towel to dry your hands. It's better for the environment, too. I think it's a fab idea, personally. And I collect cute towels. I like to change my towels up every few weeks to keep things interesting. And when I saw these were on sale, I bought one for me and one for David, since he needed one. And then, on the 29th, we went back to British Hills for a night. It was great to see everyone! We took a stupid early shinkansen to get there in time to catch the 10am bus. We had to leave home at 7:20, to catch the 7:46 train at Morisekinoshita station, to catch the 8:20 shinkansen from Sendai. And then we got to Shin-Shirakawa at 9:19, and we had to kill some time. So, we grabbed breakfast and sat and chilled. We picked that bus, since we thought it would be dead. And on man, were we wrong! Turns out, there was an observation tour going on for prospective school guests and it was crawling with people! Our bus was totally full! Crazy. So, we got to BH, checked in with James and then headed over to the tea room. Eriko was working and she's become a certified tea master in the time we've been gone! That's so cool! We were supposed to meet Belinda for lunch, so we grabbed a small snack and chilled. I got the Ascot tea set. Quiche, a scone and honey caramel tea~ Yum yum. And Nagayama-san, the chef, gave us a cute baked meringue snowman as a treat! Not a very good pic, but oh well. The lighting was pretty romantic. We had a candle on the table and the lights were dim. Our server was Carrie. She came to BH just as we were leaving. She got my old room, actually. She's from a town about an hour and a half away from my hometown. Really nice girl, and she came over and chatted a lot with us during the night. After dinner, we popped over to the pub and hung out with Belinda, Dharmesh, Brett, James, George, Carrie, Homani and Natsuki. It was a great night. And the next day, we had a lunch date with George which was fun. I miss George! He's so much fun to talk to! sadly, we had to leave at 2pm, so we went to go catch the bus and I finally got to see Megumi! She was off the day before, but she and I had a huge hug and a quick catch up before the bus left. We took the shinkansen back home, and I grabbed a cute green tea for the ride. And then, it was New Years Eve. David and I didn't really want to go anywhere, so we had a very low key night. I made us pizza and we ate that and had some snacks for the night. I watched old Gaki no Tsukai Batsu Games from pervious years and Arashi shows and David watched anime. At midnight, he came over and gave me a kiss, though~ Awwwww. <3 And that brings us to today! My aim for the new year is to improve my Japanese to the point of being able to hold my own in a conversation. And to monitor my spending more. I made one last big purchase at the end of December, and now, I want to save my money for a trip home in May, or failing that, to go to Disney Paris at Christmas next year. So, we'll see what happens. I'm glad to see you together in Japan. Perhaps you or your blog readers might want to have a look at “Simon and Hiroko,” a dramatic love story located to a large extent in Japan, which has gathered several appreciative reviews and blog interviews. I wish you’d take a stab at it too, as impressions from current residents would be very special for me. I lived two years in Tokyo and I enjoyed the place very much.